The Chrome DeathBot is a Limited Edition Physical weapon. 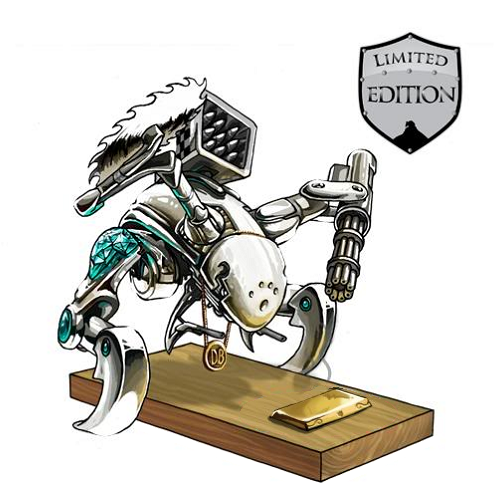 This limited edition version of the classic DeathBot features shiny chrome-plated panels, with a lot o' bling. The motors have been tweaked a little to bring more power to the chain gun and saw blade, the laser power has been increased by 5 kilowatts, and the missile guidance system has been improved using the newest in mouse-seeking technology. The King has allowed this weapon to be sold for a limited time only. "For the MouseHunter who has everything." The Chrome DeathBot is a Limited Edition weapon and can no longer be acquired by Hunters. It was available for 512,800 gold from Ronza's Traveling Shoppe during her Hunter's Reward Weekend visit. It refunded for 92,304 gold at the same location. Fluffy DeathBot – A Mouse DeathBot with a blueprint skin applied. Grungy DeathBot – A Mouse DeathBot with a blueprint skin applied. Mouse DeathBot – The base version of the DeathBot. PartyBot – The party version of the DeathBot. 16 August 2008: The Chrome DeathBot was introduced. The Chrome DeathBot was originally named the DeathBot (Chrome Edition). Its name was changed with the release of MouseHunt Version 3.0.